I have some leftover curry chicken left, so I decided to use these curry chicken and potatoes to prepare some curry puffs. 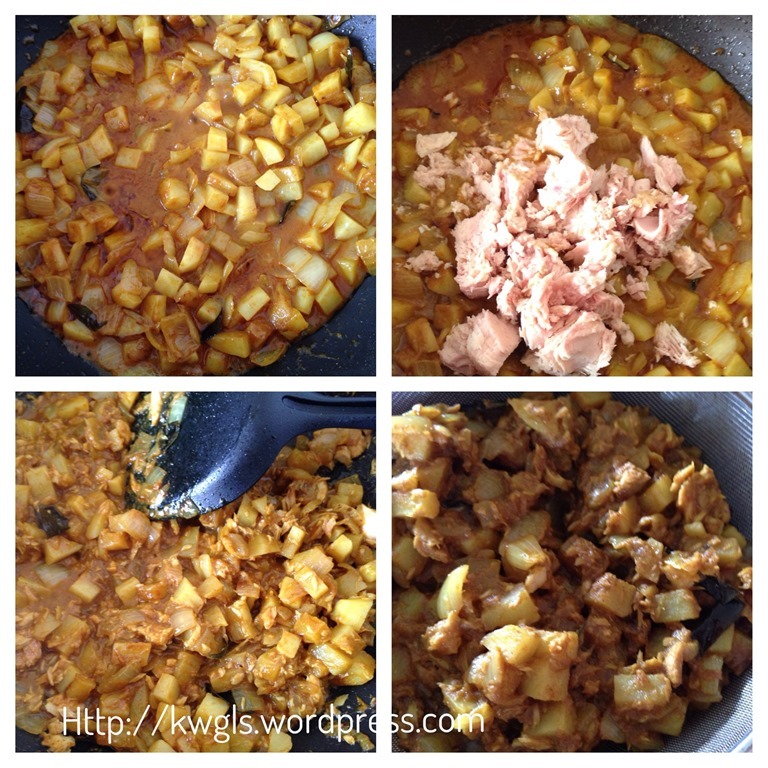 To transform the curry gravy into the filling, you will need to cut the curried potatoes and meat into small pieces, cook over the stoves and thicken with some plain flour or corn starch. Fried until it dries up. 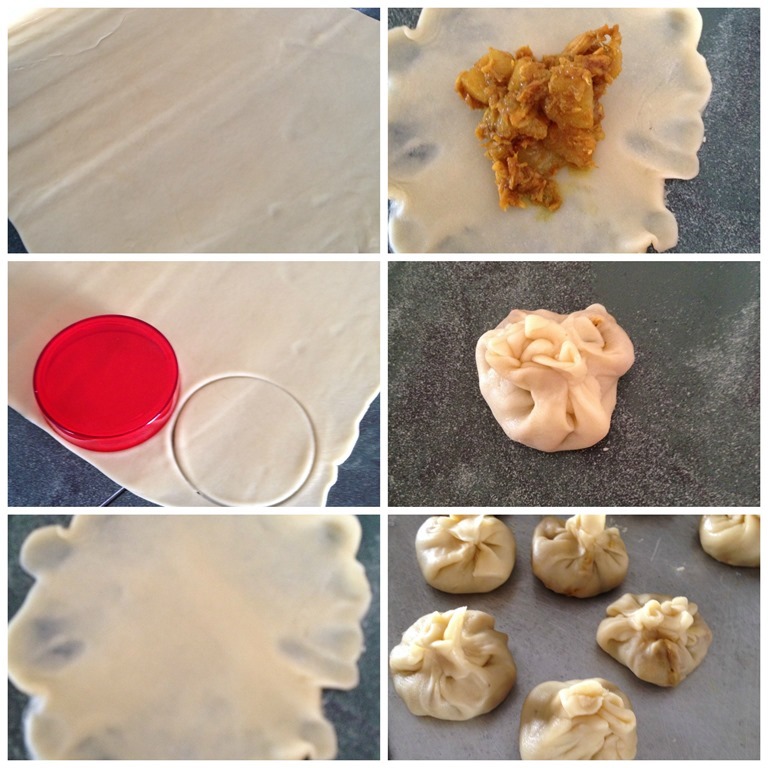 Please scroll down for the proper shaping of the curry puff. 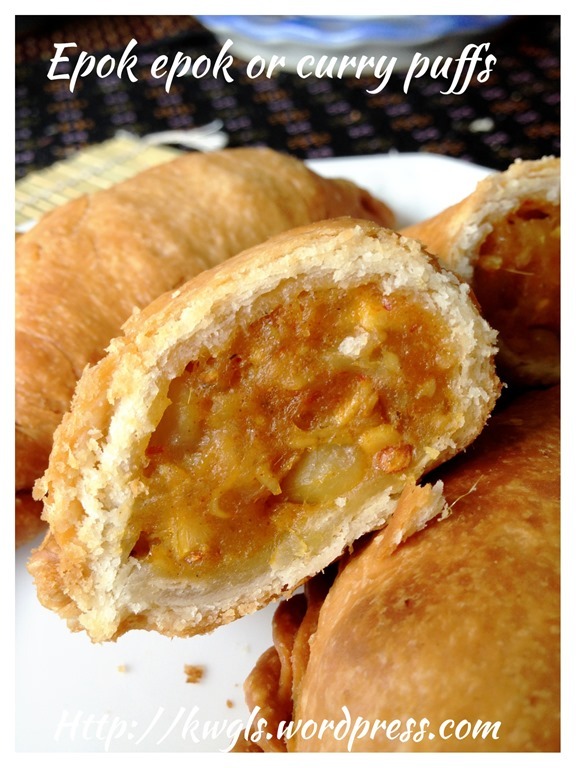 Epok Epok or potatoes curry puff is one of the very common snacks in Singapore, Malaysia and Thailand. 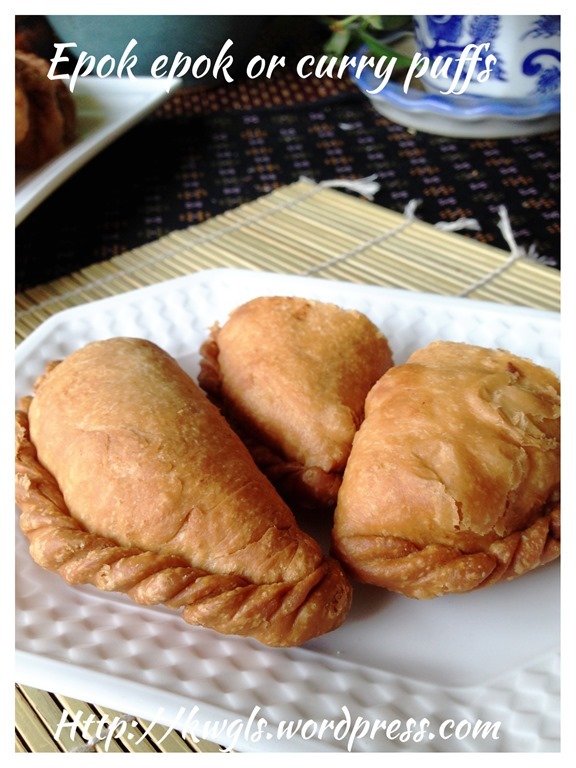 At times, it was called “karipap”. My kid is an Epok Epok fanatic. He had reminded me to buy him this for his breakfasts for the last few days. He is just like an old man, grumble and grumble. He will remind me once in the afternoon, once at night, suddenly during shopping, or just before going to bed. I knew he like it, so do my other family members and myself. Since everyone like it, why not I learn how to prepare this myself. Malaysia and Singapore are multi racial countries. As a Malaysian and Singapore Permanent Resident, I am proud of our racial harmony especially when I travelled overseas. We have 3 major festivals each year, Chinese New Year for the Chinese, Hari Raya Aidilfiltri (Eid Mubarak) for the Muslims (predominantly Malays) and Diwali (Deepavali) for Indians. 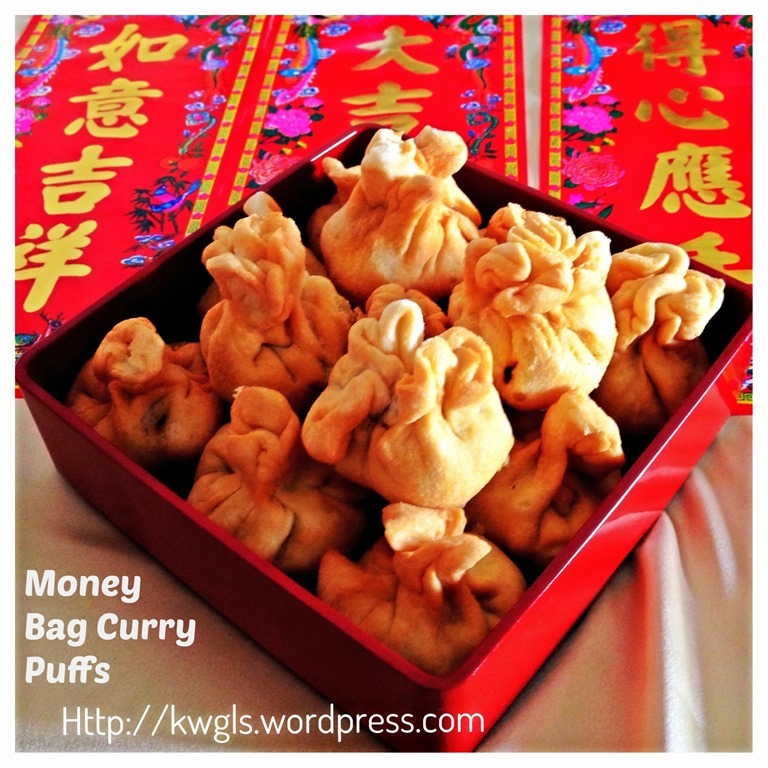 It is definitely not wrong that as a Chinese, we incorporate some Malay cuisines in our Chinese New Year delicacies. 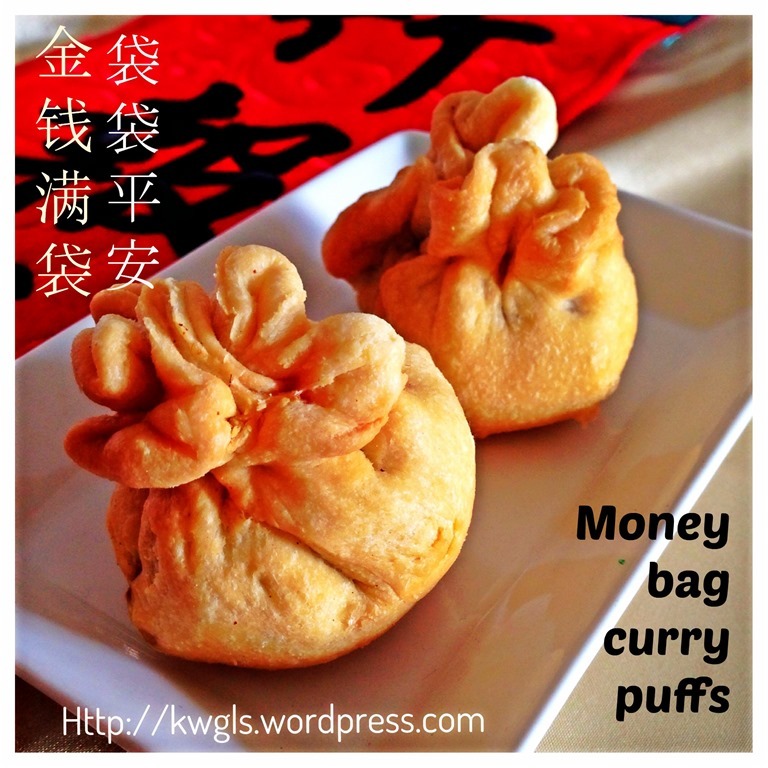 Curry puff (Malay: Karipap, Epok-Epok; Chinese: 咖哩角,咖哩饺; pinyin: gālí jiǎo; Thai: กะหรี่ปั๊บ, RTGS: karipap, IPA: [karìːpáp]) is a Malaysian, Singaporean, and Thai snack. 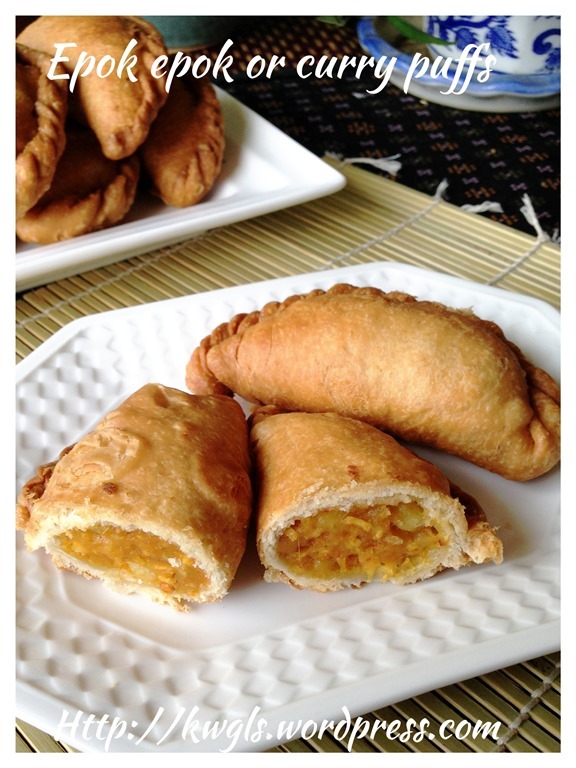 It is a small pie consisting of specialised curry with chicken and potatoes in a deep-fried or baked pastry shell, and it looks like the Portuguese stuffed bread called Empanada. 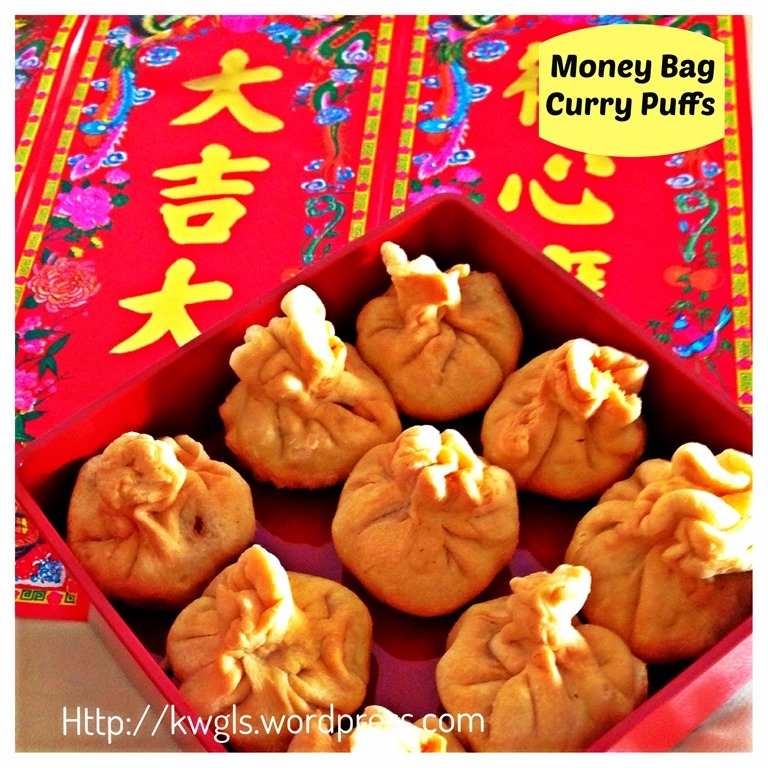 The curry is quite thick to prevent it from oozing out of the snack.A common snack in the region, the curry puff is one of several “puff” type pastries with different fillings, though now it is by far the most common. Other common varieties include sardines and onions or sweet fillings such as yam. 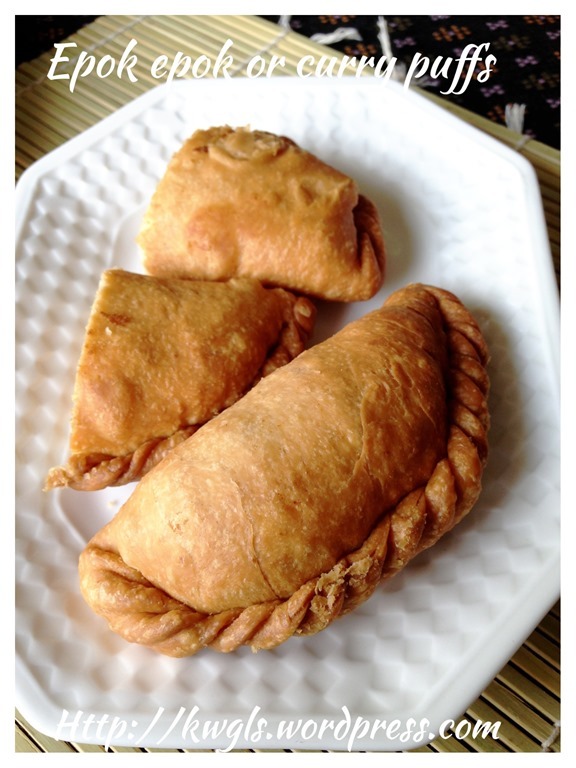 Though differing in the type of pastry used, the shape and structure of the curry puff may suggest that it has its origins in the Cornish pasty. 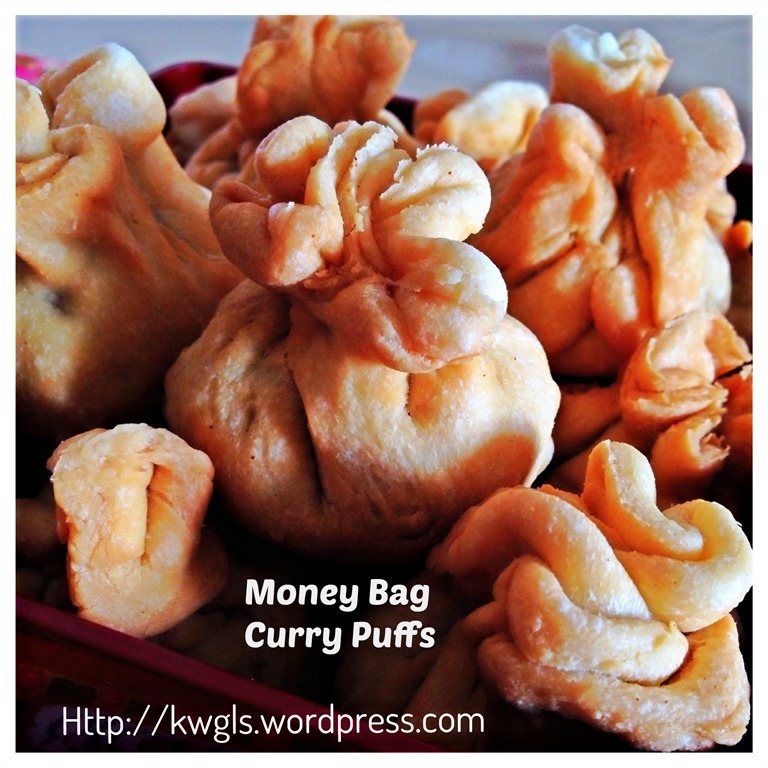 Curry Puffs are a very popular snack item in Indian Bakeries. 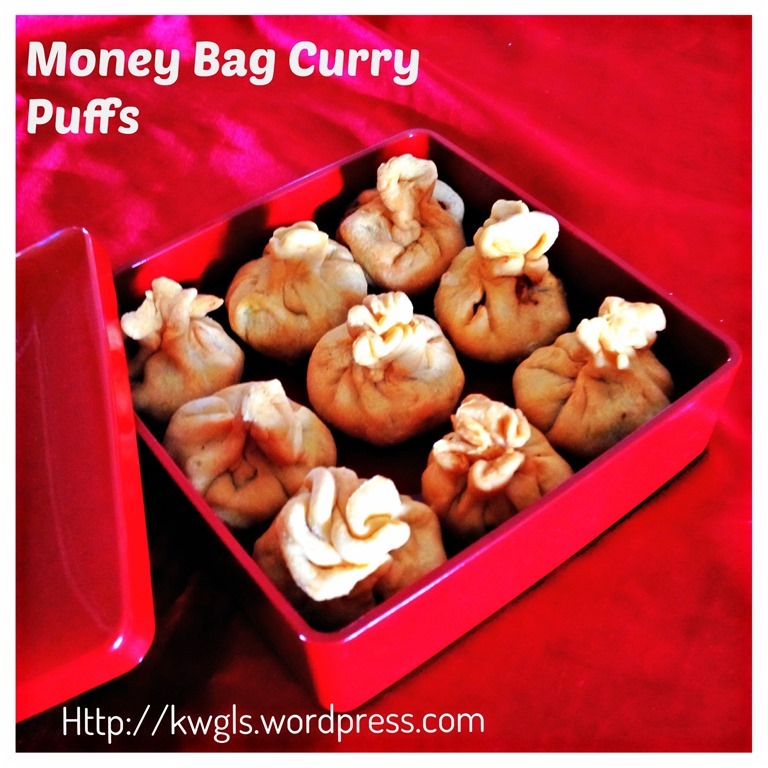 Several variations of it are available based on the content of the puff, like Egg puff, chicken curry puff and paneer puff.Some varieties of the South Asian samosa are very similar to curry puffs. From the above definition, one would have a free hand to design the fillings you like. 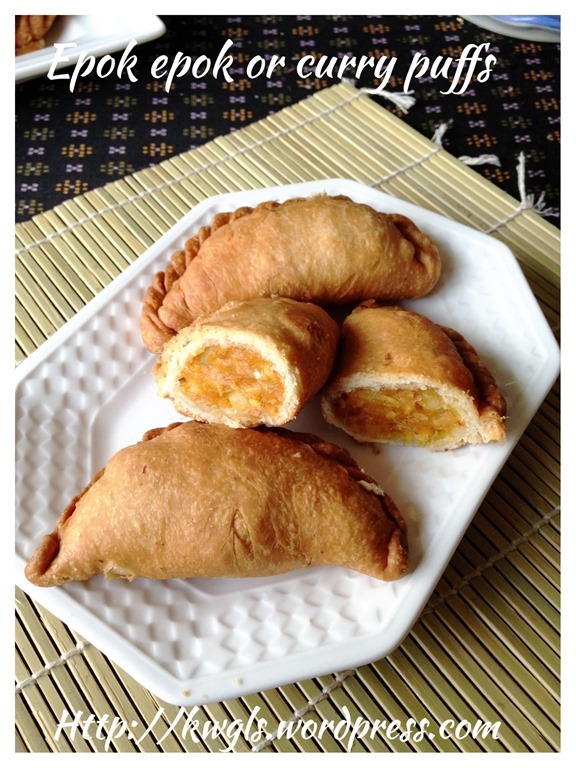 If you still want curry puff but afraid it to be spicy, you can use the Japanese curry roux to make it into a Japanese curry puff. 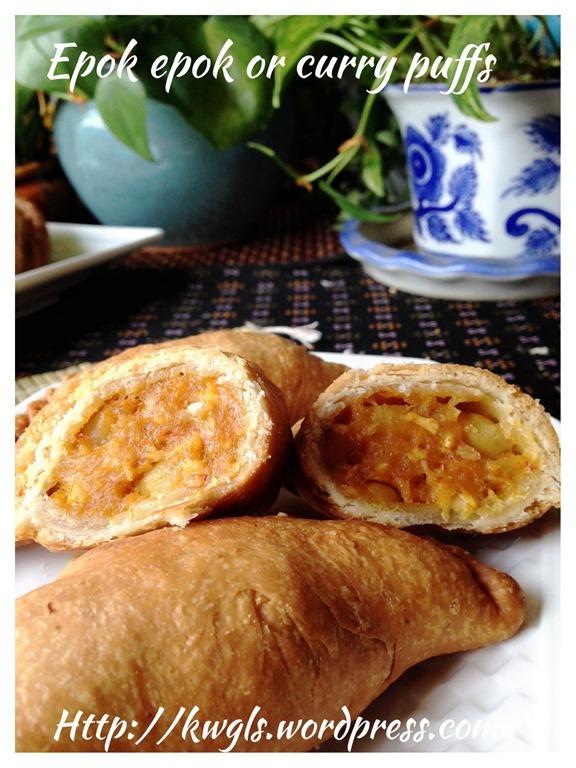 You can refer to the post Japanese curry pies, a post that was once featured by Asian Food Channel on how to make turmeric curried potatoes that are not spicy. This recipe is the simplest recipe and full of variations and feel free to increase or decrease the quantity stated here. 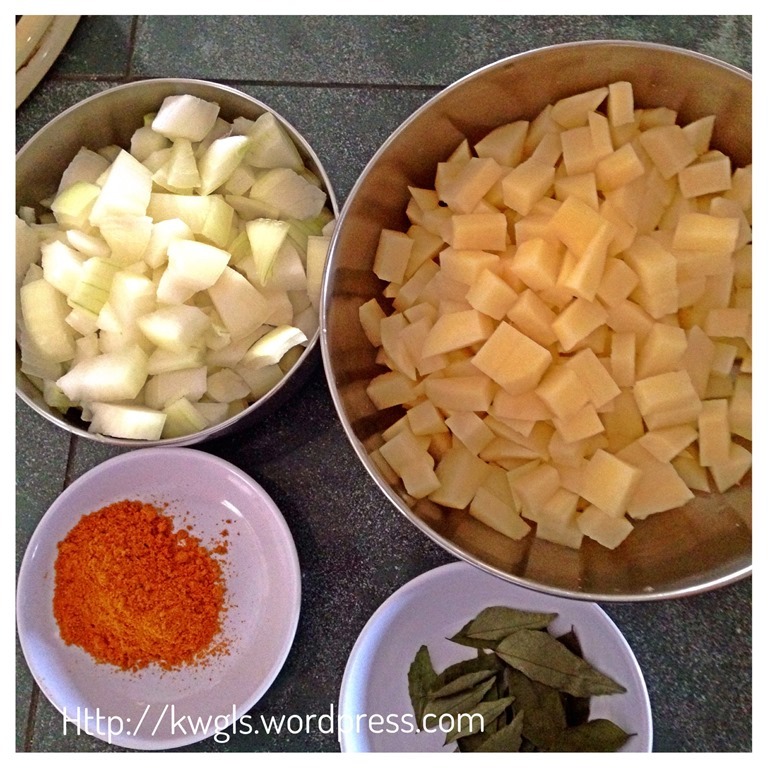 Optional ingredients – Any spices that are used to cook curry such as chilli powder, cloves, anise, can be added. You can refer to the more authentic original recipes here. 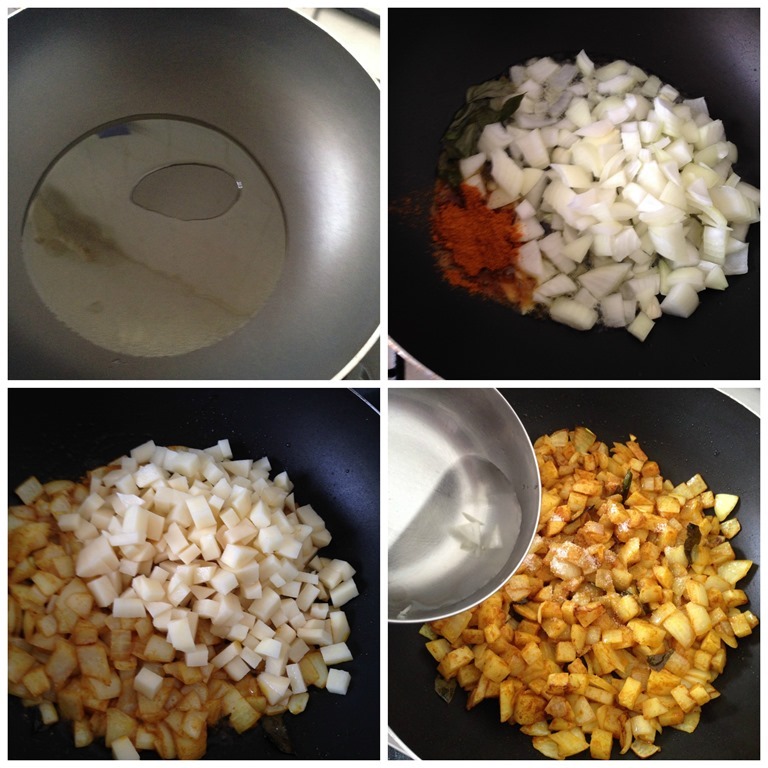 In a sauce pan under medium heat, put some cooking oil and stir fry the diced onion, curry leaves and curry powder until fragrant and onion are soft. Add in diced potatoes, stir fry until well combined. Add 1/2 cup of water. Let it simmer until the potatoes are soft and water dries up , add canned tuna (you can add earlier if you want) and seasonings to taste (e.g sugar, pinches of salt, pepper). Set aside for later use. In a mixing ball, beat your butter/margarine until light and pale. Add in sifted flour and cold water. Use the mixer’s slowest speed to stir until combined. 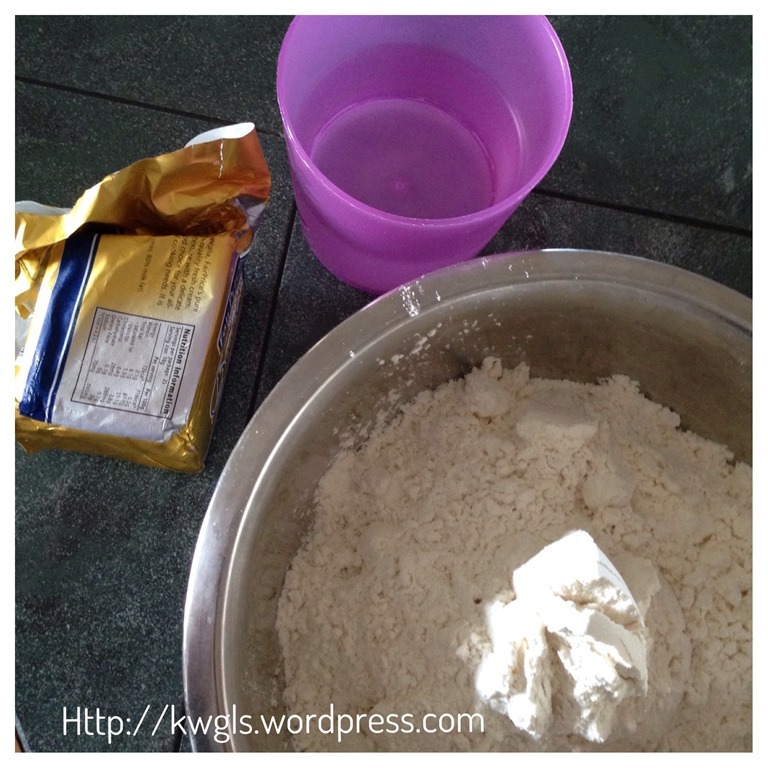 Take out and lightly knead until smooth. 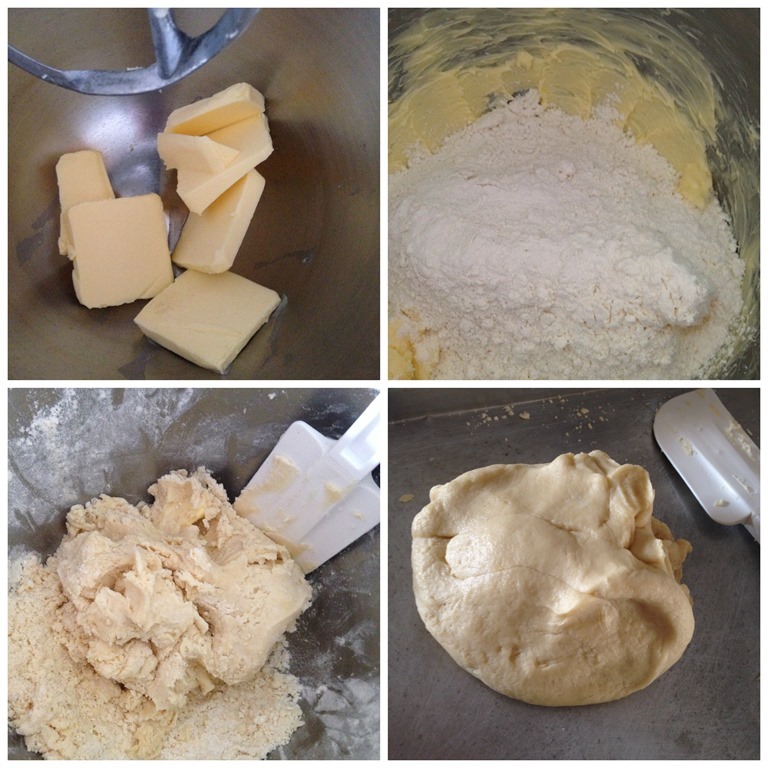 Note that you can just rub the butter with flour with your hand, gradually add the water and knead until smooth. Stand mixer is optional. Roll the dough in a flat surface using a rolling pin. Cut a round shape out ( I used the cover from a Chinese New Year cookies container). Take out and stretch the sides. The sides should be thinner than the middle. 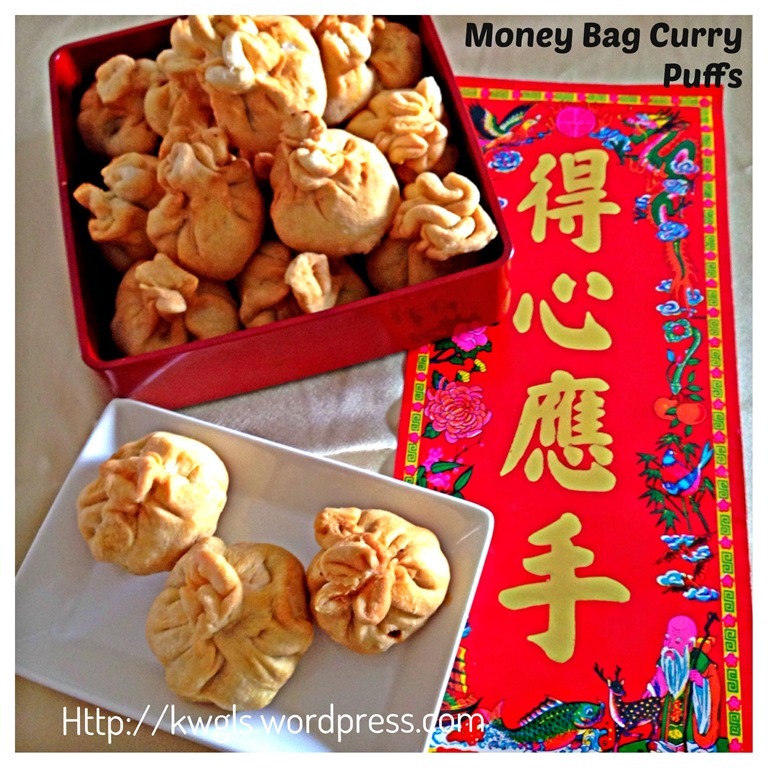 Put 1-2 tablespoons of curry puff fillings. Pull the sides up and make it shape like a money bag. Remember to close the dough in the middle. Set aside for later use. In a sauce pan, have adequate cooking oil. Heat until when a wooden chopstick inserted, bubbles start to emit. To counter ensure the correct oil temperature, cut a small piece of dough and throw in the oil. If it turn brown too fast, the oil is too hot. Lower the heat to medium. Once the oil temperature is ascertained, put in all the money bags and deep fried until golden brown. If you are not speedy enough to handle the frying fitters, use medium heat. But when the colour is slightly golden, increased the heat to high and take out after one minute. 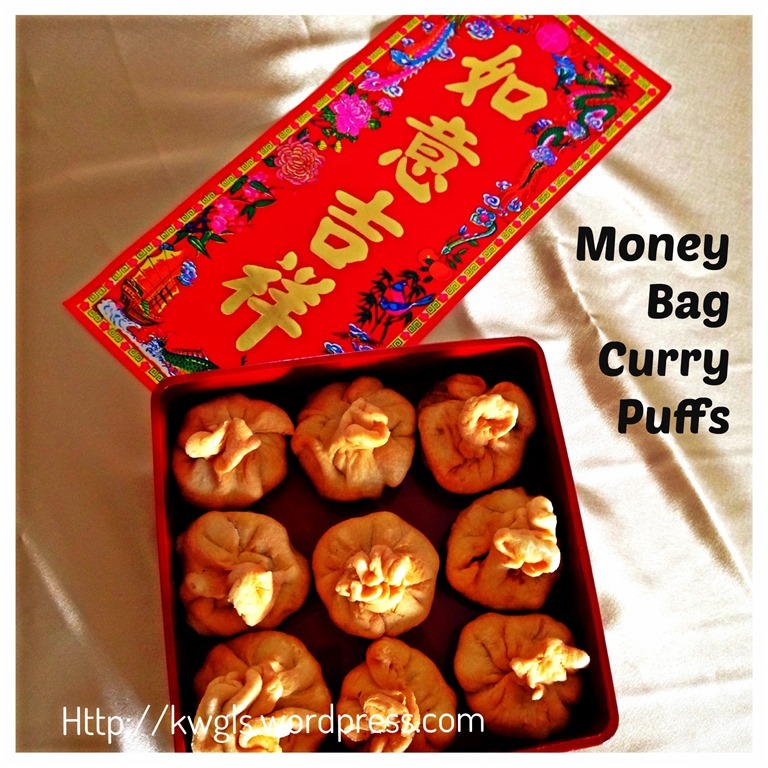 This is to prevent the oil from absorbing back to the money bag so that you will have a crispy money bag. Drain and put on a piece of kitchen towel or oil absorbing paper before serving. Best served only when completely cooled but still crispy. 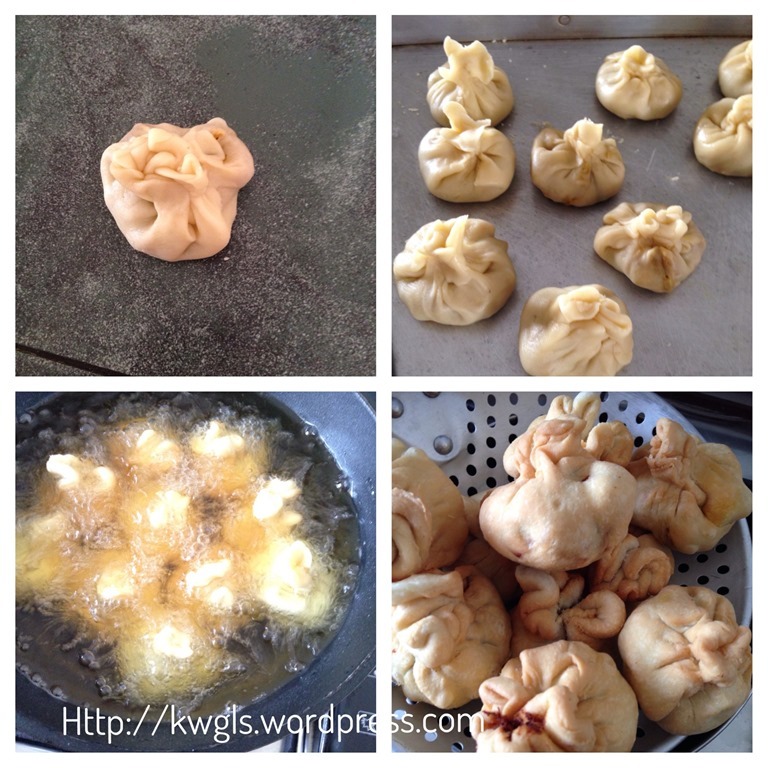 Divide the dough into equally about 30-40 grams . Shape it into a ball and lightly flatten it. Use a rolling pin to roll it thin and of about 6-8 cm diameter. 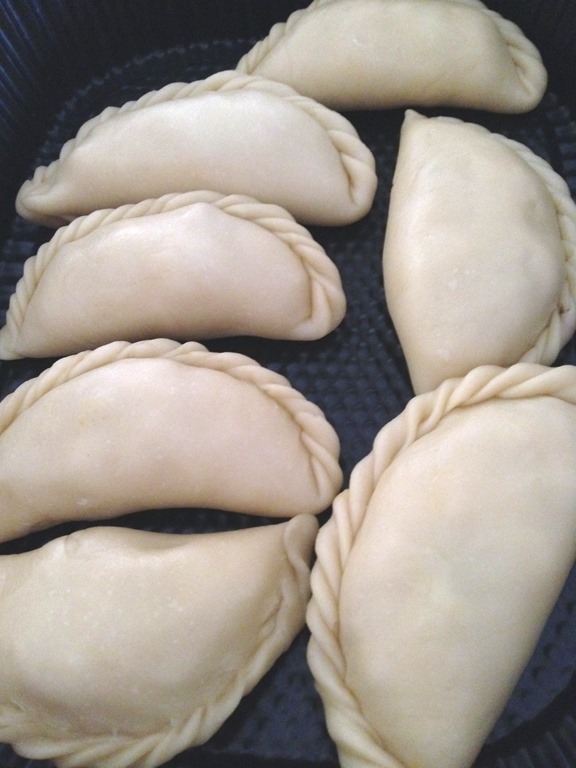 Place a tablespoon of two of the fillings on the centre of the dough. Fold half and seal the edges. Slightly press the fillings such that it conform to the shape we want. Pinch the edges in a regular pattern until all the edges are pleated. I honestly believed that this is definitely a good pastry to promote racial harmony. 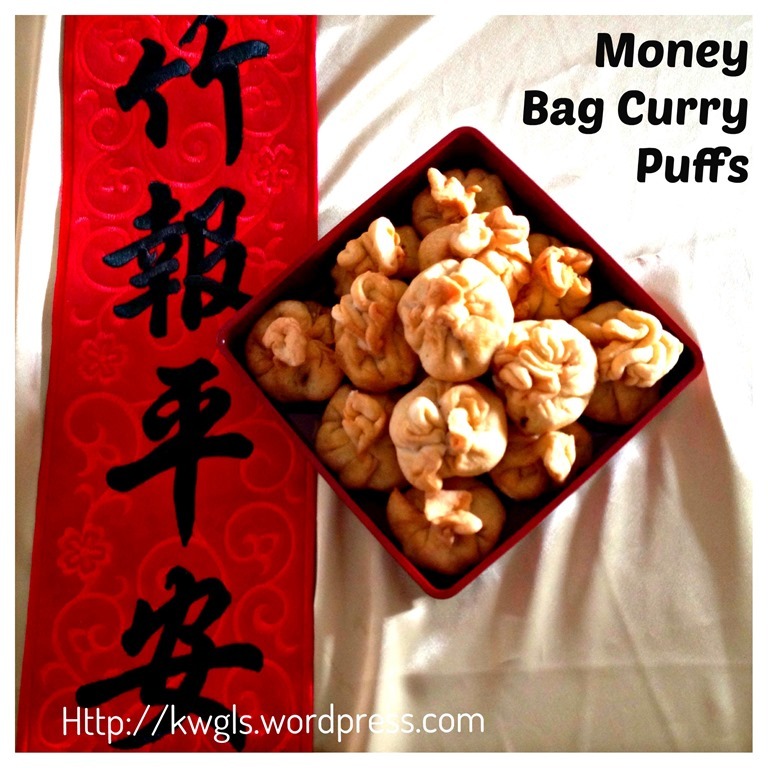 While this may not be able to keep for long, it will be an ideal party snack food for your Chinese New Year gatherings. 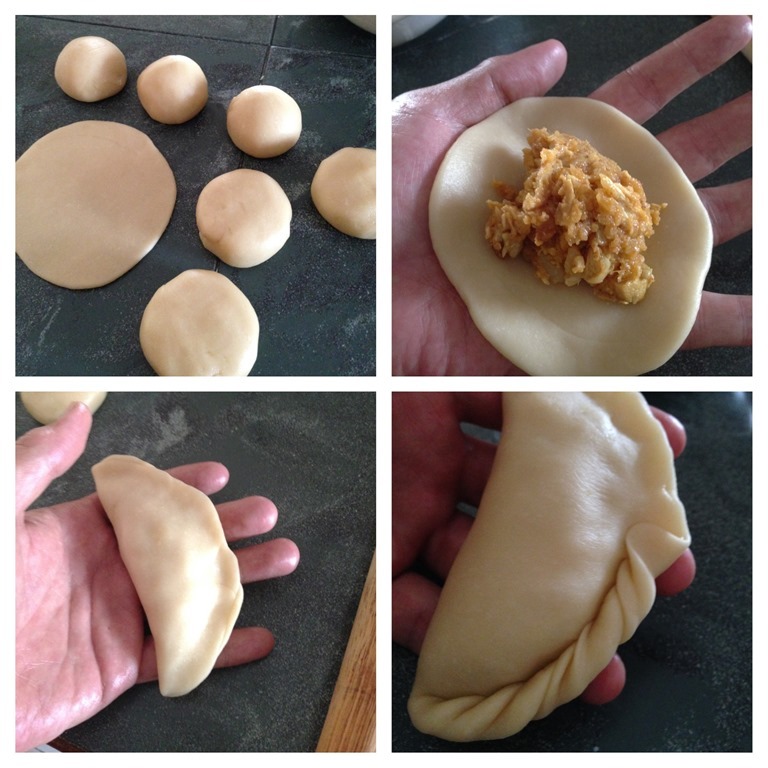 Well, if you have good shaping skills, you can shape liked the traditional curry puffs as the recipe is essentially the same recipe. 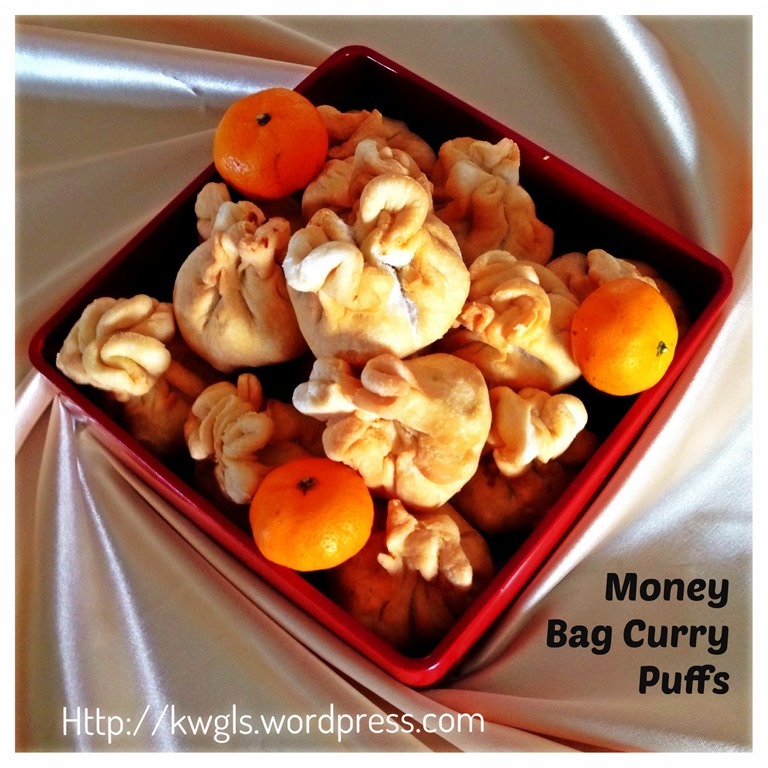 This entry was posted in Chinese and Asian Cakes and Snacks, Chinese New Year 2014, Food Preparation Series and tagged 8, Chinese New Year 2014, curry puffs, epok epok, GUAI SHU SHU, Guaishushu, kenneth goh, money bag, postaday. Bookmark the permalink. 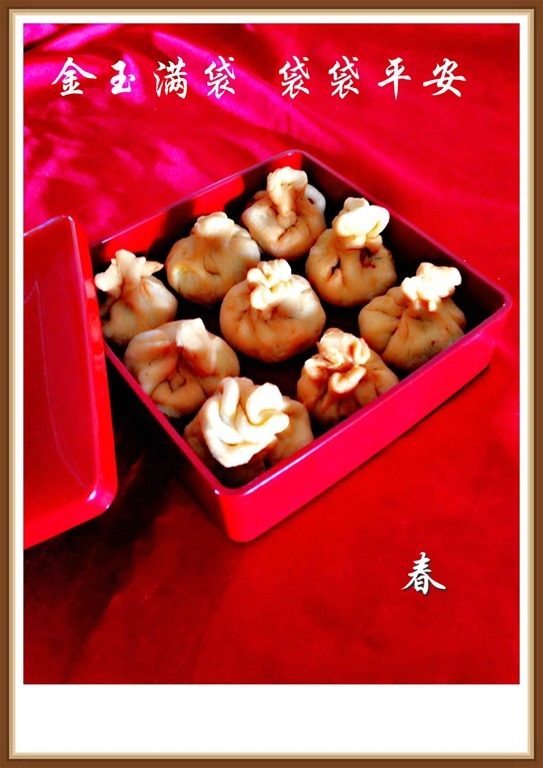 I’m sorry that I have to delete this post from our linky list because it is not a CNY cookie and also it is not a Jan 2014 post. I have also informed you all other that I have removed too for the same reason via your email. Hope that you don’t mind. Sorry that I have to do… Rules are rules. Sorry! Hi Kenneth, may I know if the texture of this is crispy and how long does it stay crispy, thanks.